What’s the Scoop on Dietary Supplements for Exercise and Athletic Performance? You probably know that a nutritious diet and sufficient fluids are important to maximize your physical performance. But you may wonder if certain dietary supplements could help you increase muscle strength, train harder, or improve performance. These types of supplements can’t take the place of a healthy diet, but some of them might have value for certain types of activity. Other supplements don’t seem to work, and a few might be harmful. Below are answers to some commonly asked questions about dietary supplements for exercise and athletic performance with links to our new fact sheet for consumers—available in English and Spanish. 1. My son plays high school football, and many of his teammates drink energy drinks. Are they safe for teenagers? The main thing to watch out for with energy drinks is the amount of caffeine they contain. Caffeine can cause nervousness, jitteriness, and difficulty sleeping, and at very high doses, it can cause heart problems and can even be fatal. Caffeine might enhance performance in athletes when taken at moderate amounts before competition (about 200–400 milligrams [mg], depending upon body weight). Many energy drinks contain around 100 mg of caffeine per serving, but some may have more. Most adults can safely consume up to 400 or 500 mg of caffeine (about 4–5 8 oz. cups of coffee) in a day. For adolescents, however, the American Medical Association recommends no more than 100 mg of caffeine a day, and the American Academy of Pediatrics says that children and adolescents should not consume caffeine-containing energy drinks at all. Have more questions? See the section on caffeine in our fact sheet on dietary supplements for exercise and athletic performance. 2. I’m training for a marathon and wonder if taking a creatine supplement would be helpful. Creatine is a compound that is stored in your muscles and supplies them with energy. Your body produces some creatine, and you also get some creatine from eating animal foods such as beef and salmon. Creatine supplements provide much larger amounts of creatine (usually in the form of creatine monohydrate) than you can get from your diet. Creatine supplements can increase strength, power, and the ability to contract muscles for maximum effort. But creatine is helpful only for repeated short bursts of intense, intermittent activity such as sprinting and weight lifting. For endurance activities like distance running, it appears to have little value. Creatine can cause weight gain because it tends to cause water retention, but otherwise, it is considered safe for healthy adults. Have more questions? See the section on creatine in our fact sheet on dietary supplements for exercise and athletic performance. 3. I am a 22-year-old male who is trying to build muscle by working out at the gym 4 to 5 days a week. I eat healthy foods, but I wonder if I should take protein powder to make sure I’m getting enough protein. It depends on how much protein you’re already getting from the foods you eat. Athletes need about 0.5 to 0.9 grams of protein per pound of body weight a day. This works out to about 90 to 160 grams for someone weighing 175 pounds. This is more protein than less active adults need, but it is still possible to get this amount from protein-containing foods. These include meats, seafood, and poultry (a 3-ounce chicken breast has 27 grams of protein), eggs (one egg has 6 grams of protein), dairy products (1 cup of milk has 8 grams of protein), beans (1/2 cup of black beans has 7 grams of protein), and nuts (1 ounce of peanuts has 7 grams of protein). If needed, protein supplements and protein-fortified food and beverage products can help you get enough protein. The other thing to consider is the “quality” of protein. Protein is made from amino acids. Your body makes some amino acids but needs to get others (known as essential amino acids or EAAs) from food. Animal foods contain all of the EAAs, but plant foods contain different ones. So if you consume mostly or only plant foods, eat a variety of them to make sure you’re getting all EAAs. 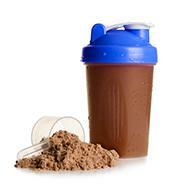 Most protein powders and drinks contain whey, a protein in milk that provides all of the EAAs. Have more questions? See the section on protein in our fact sheet on dietary supplements for exercise and athletic performance. According to the U.S. Food and Drug Administration (FDA), some products that are promoted for increasing muscle mass and strength may contain steroid or steroid-like substances. (See FDA Consumer Update on Bodybuilding Products .) These products are labeled as dietary supplements but are actually illegal, unapproved drugs, and they have been associated with serious health risks including liver injury. If you are taking any bodybuilding products that claim to contain steroids or steroid-like substances, stop taking them immediately and talk with your health care provider—especially if you are experiencing any symptoms such as nausea, weakness or fatigue, fever, abdominal pain, chest pain, shortness of breath, jaundice, or brown or discolored urine. Have a question about dietary supplements? The Office of Dietary Supplements (ODS) provides general information about dietary supplement ingredients in response to questions from consumers, health professionals, students, and others. While ODS cannot answer specific medical questions, make referrals, or give personal guidance on the use of dietary supplements, ODS’s registered dietitians on staff reply to each inquiry and give useful, scientific, and evidence-based information. Send your questions about dietary supplements to ODS@nih.gov.